The piano trio Trikolon was founded in Vienna. Its members currently study with Johannes Meissl, Christoph Eggner, and Stefan Mendl at Vienna’s University of Music and Performing Arts, and 2015 saw the ensemble also accepted into the chamber music class of the Wanderer Trio at the Conservatoire à rayonnement regional de Paris. Trikolon was also the winner of the Bank Austria Art Award and several international competition prizes in 2015—including 1st prize at the Svirél International Music Competition, 1st prize at the I Rein del Aneto International Chamber Music Competition, 3rd prize at the Malta International Music Competition, and the Special Prize as finalists for the Gianni Bergamo Classic Music Award. Trikolon has been giving regular performances abroad, such as at the 2015 Orlando Festival in Kerkrade and the 2016 Harmos Festival in Porto, as well as in Rumania, Spain, Slovenia, and Malta. 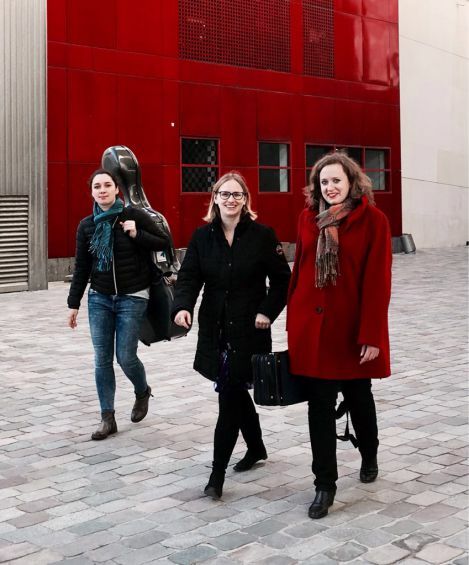 And at master classes and festivals, the Trio has gathered experience from renowned musicians such as Evgenia Epshtein, Patrick Jüdt, Anita Mittlerer, Péter Nagy, Henk Guittart, and Mark Steinberg.